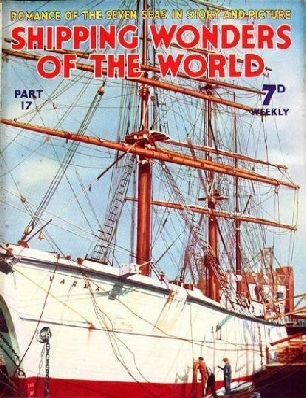 Part 17 of Shipping Wonders of the World was published on Tuesday 2nd June 1936. This issue included a colour plate illustrating Taking in the Crossjack from the painting by Claude Muncaster. This accompanied the article on Sea Shanties. The coloured plate was attached to page 525 of this issue. The cover of the current issue shows the Finnish sailing vessel Varma (or Warma) being repainted in Regent’s Canal Dock, Stephney, London, after one of her voyages from the Baltic with a cargo of timber. The story of the Araby, concluded from part 16. You can read more about this salvage in chapter XIII of David Masters’ book The Wonders of Salvage. Six lakes in North America form the world’s greatest inland fresh water area. Colossal engineering feats involving a system of deep water canals have made an outlet to the sea for shipping. The Great lakes of North America are among the world’s busiest waterways. With an area of over 95,000 square miles of fresh water, they comprise a natural waterway surrounded by some of the richest industrial and agricultural areas of the North American continent. On these lakes are ship types equal in size to the largest ocean-going freighter, and big paddle ships or “side-wheelers” which would dwarf the excursion vessels of Europe. This chapter is by A C Hardy and is the fifth article in the series on World Waterways. TAKING IN THE CROSSJACK in a four-masted barque. The lowest square sail on each mast is normally called the course - for example, fore-course or main-course on the foremast and mainmast respectively - the main course being derived from the Old French world cors, a body. The course was the original square sail of primitive rig and was the body to which all the other sails were additions. 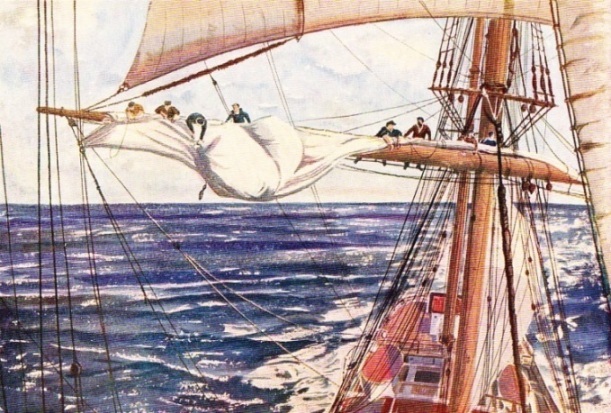 The sail on which the men in the picture are working, however, - the lowest square sail on the mizenmast - is an exception, and is always called the crossjack (pronounced cro-jack). The plate is from the painting by Claude Muncaster, ARWS, ROI. Coastal motor-boats (or CMBs) are the small high-speed torpedo boats evolved in Great Britain by John I Thorneycroft and Company Ltd. The CMBs carry two torpedoes, and rely only on speed and helmsmanship to escape punishment. They are, in smooth water, the fastest naval craft, and in fair weather no other surface craft can catch them. During the war of 1914-18, coastal motor-boats played a part out of all proportion to their size. They attacked enemy submarines, destroyers, aeroplanes and patrol boats, laid mines and made smoke screens. On St George’s Day, 1918, they rendered conspicuous service during the historic raid on Zeebrugge. This chapter is by Sidney Howard. The sea shanties which are so popular nowadays have altered in many ways since they originated in the early sailing ships to help the crews to work together. Every shanty had its own purpose, but modern machinery often obviates the necessity of singing shanties even in sailing ships. Shanties were rarely sung for amusement. They were working songs, designed to get the last ounce of strength from small crew. Shanties therefore had a time and rhythm of their own, designed to give the concerted pull on the rope at thee right moment. They were not ballads and cannot be made into ballads with any success. It is difficult to get the proper rhythm and time unless you have a rope to pull or a capstan bar to push. The back-breaking weight naturally kept the time slow. Only the shanties for the jib or staysail halyards or the capstan were sung at any noticeable speed. This chapter is by Frank Bowen. The construction of vessels used for coastal services differs radically according to local requirements. The coasters working on the Australian coast, where a great deal of freight is picked up from lighters in open roadsteads and in rivers, are designed to carry the biggest load in the smallest space. The composite drawing with this article is intended to illustrate the smaller types of ships running on the Australian seaboards and rivers. Such a vessel is known technically as a raised quarter-decker. She has a small forecastle and a long well deck, with a hatch nearly 50 feet long and 14 feet wide. This is the twelfth article in the series on Merchant Ship Types. This great navigator’s fame rests on his achievements in exploring and charting lands already found rather than on the discovery of new countries. The accuracy and speed with which he carried out his work won for him immediate and world-wide recognition. Captain Cook was the supreme navigator-explorer. His greatest achievement was the correct plotting on the map of many lands in the Southern Hemisphere. He charted New Zealand and the east coast of Australia. He sailed far south to the Antarctic, and in three voyages filled in the blanks the the early explorers had left on the map. Moreover, Cook was the first man to conquer scurvy, the disease that had been the bane of all ocean voyagers up to his time. His strict attention to detail was extraordinary, and his vision never failed however great the pressure of immediate circumstances may have been. His rectitude and courage inspired the men who sailed with him, and they gave him affection as well as obedience. This chapter is by Sidney Howard and is the second article in the series Supreme Feats of Navigation. Inventors with revolutionary ideas in naval architecture were responsible, particularly in the nineteenth century, for the construction of many strange and remarkable types of ships, but the ambitions of the designers were seldom realized. All through the history of shipping there has been a succession of freak designs in naval architecture. They represent attempts to produce a revolutionary ship that will overcome all the difficulties of the shipping industry and put its inventor in the way of a huge fortune. When the object is to eliminate certain excessive costs or the handicaps to trade, the inventor is often successful enough until the circumstances change. When, however, the inventor has attempted to evolve a hull form that will cope more successfully with the resistance of the water or with the effect of waves, he has never been entirely successful, because it is only the slow and studied development of existing features that proves of any avail. The article is by Frank Bowen. For the first time in history wireless and aviation wee responsible for the rescue of an Arctic expedition when in 1934 Russian aeroplanes saved the lives of more than a hundred men, women and children stranded on the Polar ice pack, after the sinking of the ill-fated Chelyuskin. This article is by E E Mills-Joyce and is concluded in part 18.